All we knew about Macedonia was that it was somewhere near Greece. We knew nothing of the lovely people or their pride in their country. We had no concept of Macedonia’s rich history or its beautiful landscape. We had no idea how great the food was, how refined the wine was, or how affordable it was to travel there. But, pretty quickly, we learned a lot about the great things to do in Macedonia and all the remarkable things to see there. Here’s a look at some of our favorites. 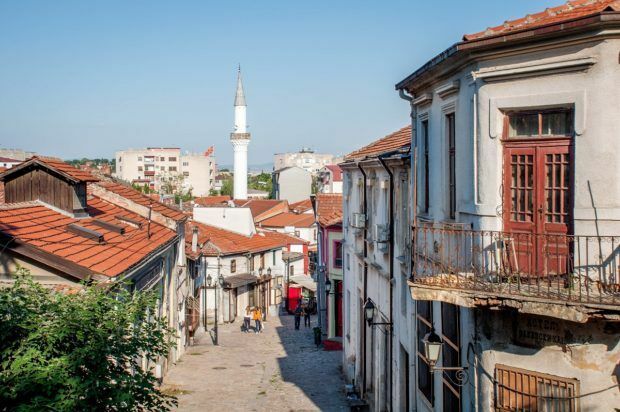 Since the 12th century, Skopje’s Old Bazaar has been the center of trade and commerce. Composed of Ottoman, Byzantine, and modern architecture, the Bazaar reflects the long and varied history of the city itself. Today it is composed of shops and restaurants as well as mosques, churches, museums, and other important buildings. 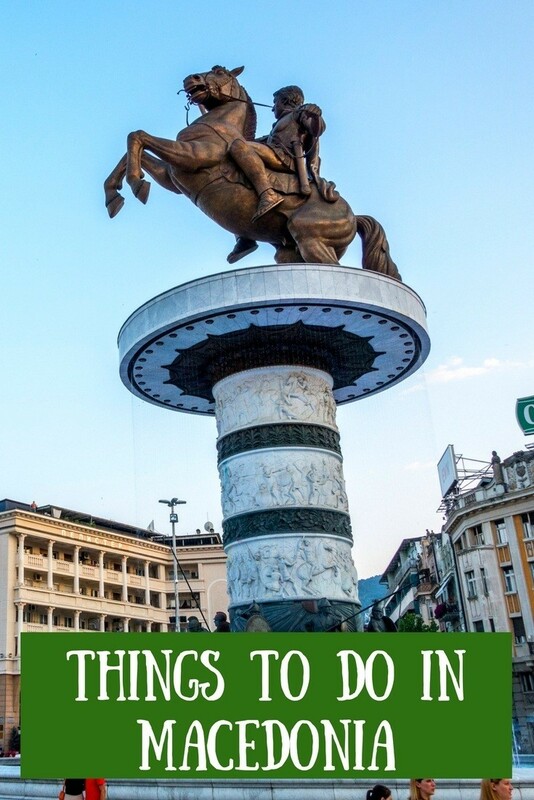 It’s impossible to miss the statues in Skopje, Macedonia’s busy capital city. As you walk around the city center, the results of the government’s “Skopje 2014″ project (which is still ongoing) are everywhere. 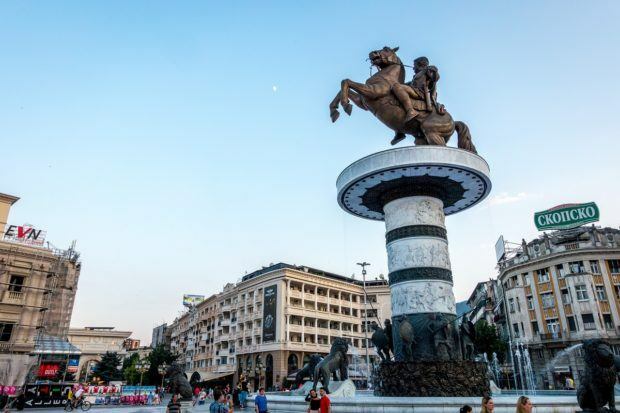 Fountains and statues honoring people and events in Macedonia’s history soar into the sky, dwarfing visitors and—in some instances—even nearby buildings. The project has not been without controversy due to its scale and cost. But, as a visitor, it is fascinating to see a country in the midst of shaping its present and past at the same time. Just 10 miles southwest of Skopje, it’s like another world in Matka Canyon. 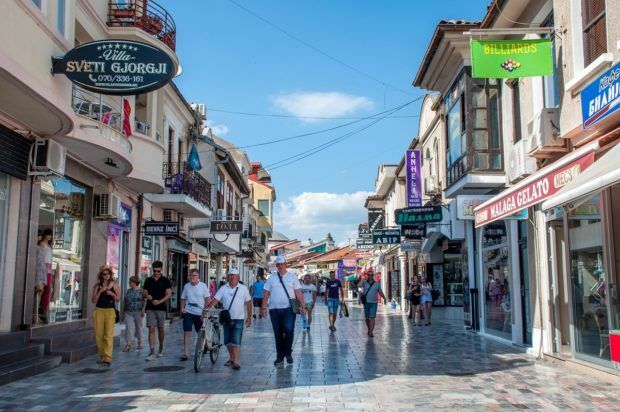 An easy half-day trip from the capital, a visit here is one of the best things to do in Macedonia. The outdoor destination is a prime location for hiking, and fishing and swimming are popular in the Treska River. 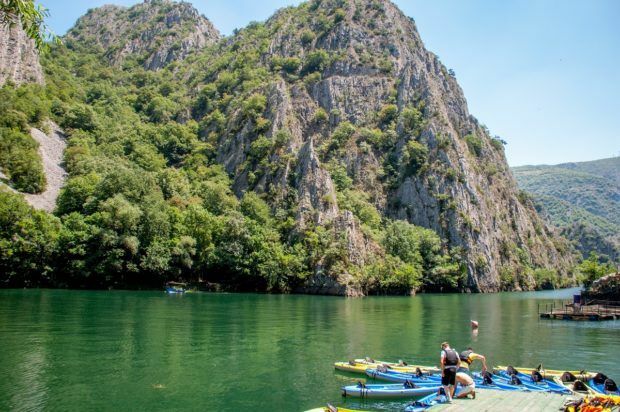 One of the most common ways to see Matka Canyon is to rent a boat to explore Matka Lake the canyon’s caves. The canyon area is also home to several historic churches and monasteries with remarkable frescoes. 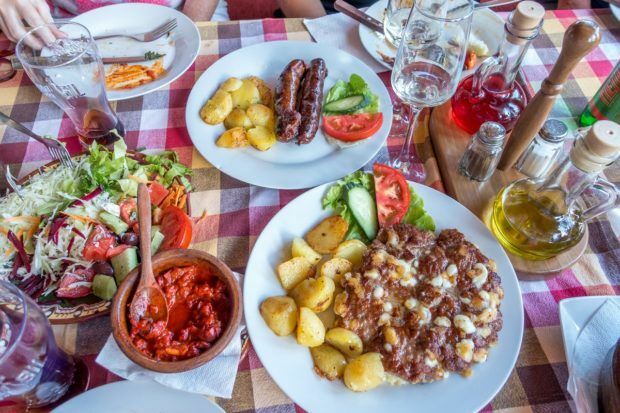 Macedonian cuisine is full of Mediterranean and Middle Eastern influences (similar to the food we tried in Albania). That means lots of fresh vegetables, grilled meats, and wine. The Macedonians also love their condiments—in particular, a spread called ajvar made from roasted bell peppers, paprika, and garlic. Also don’t miss their flaky, savory burek pie; pleskavica, a grilled hamburger-like specialty; or tarator, a yogurt and cucumber dip. 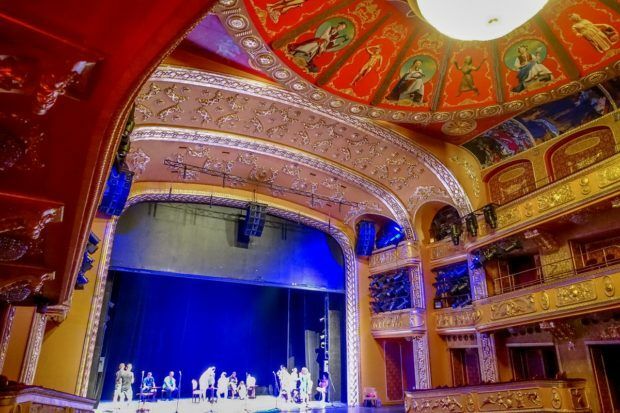 Skopje’s opera house is the city’s pride and joy. Its sumptuous interior design and perfect acoustics make it an ideal home for performances of the world’s best operas. Rising high above the city, Mount Vodno is the site of one of Skopje’s more popular attractions—the Millennium Cross. 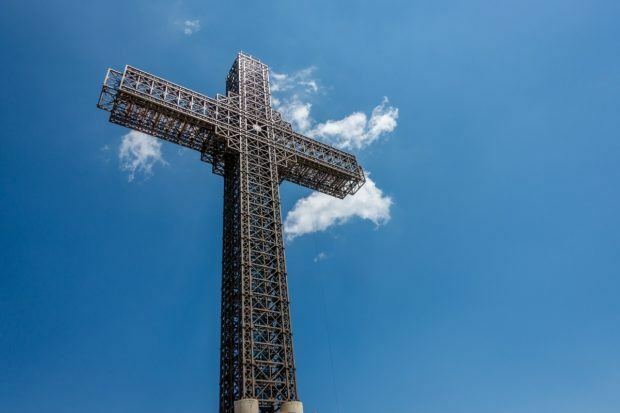 Finished in 2002, the 216-foot-tall cross is the biggest cross in the world and was constructed to celebrate 2000 years of Christianity in Macedonia. 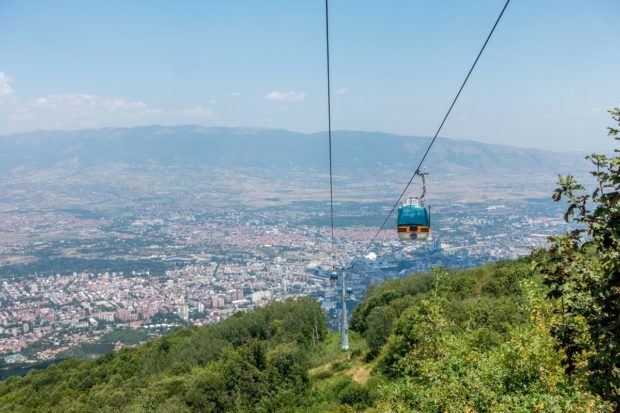 Visitors to the cross can reach the top via a hiking trail that cuts its way up the mountain or by a cable car (only about $2 roundtrip). The views from the cross’ base at nearly 3500 feet are impressive. Gonxha Bojaxhi, otherwise known as Mother Teresa, was born in Skopje in 1910. 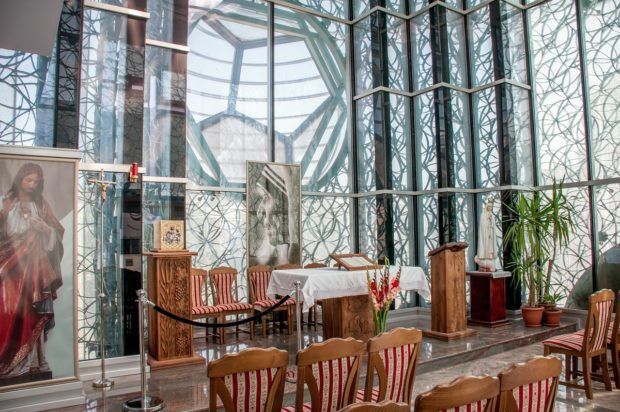 Her birthplace and other related landmarks are no longer standing, so the Memorial House of Mother Teresa has been constructed in her honor on the site where she was baptized. The house (actually a combined museum and chapel) displays memorabilia related to the Nobel Peace Prize winner who lived in Skopje for 18 years. The church upstairs is surprisingly ornate and futuristic looking. Macedonia is home to nearly 100 square miles of vineyards and has a wine-producing heritage that stretches back centuries. 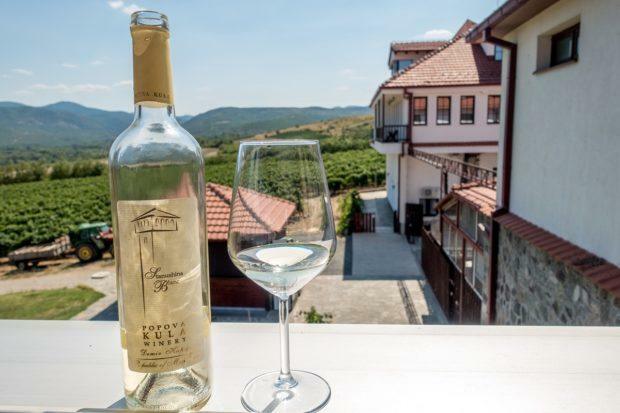 Popova Kula, one of the country’s best wineries, is known for its high-quality Balkan wines like Stanushina, Vranec, and Cabernet Sauvignon. What they don’t grow on the property, they source from smaller vineyards within just a few miles. 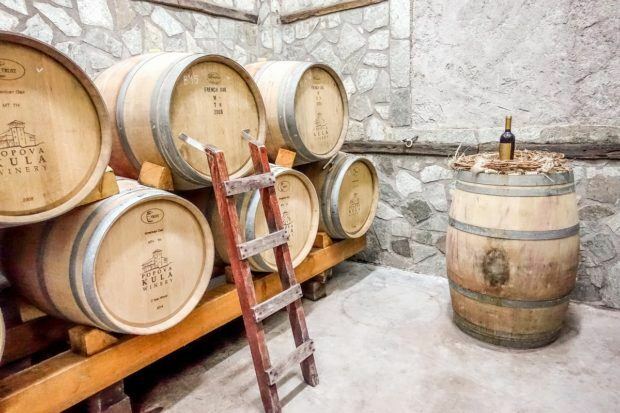 There’s also a great restaurant overlooking the vineyards and an on-site hotel which gives visitors ample time to roam among the vines (and sample more than a couple of Popova Kula’s fabulous vintages). Grab a bottle and some space at a picnic table on the lawn, and enjoy. The town of Ohrid, on the shores of Lake Ohrid, is one of oldest European settlements. 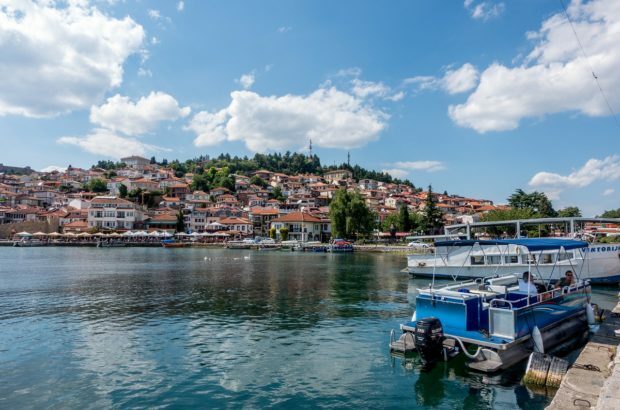 Built mostly from the 600s, Ohrid is home to a number of historic monasteries and famous Byzantine-style icons as well as remarkable architecture and ancient ruins. These are just a few of the reasons it’s been designated as a UNESCO World Heritage site. 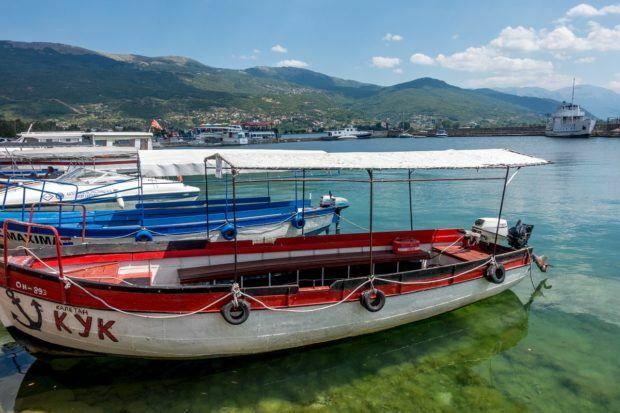 In addition to its deep history, Ohrid features more recent Ottoman architecture from the 18th and 19th centuries and is now a bustling seaside city with charming restaurants and an inviting boardwalk by the beautiful lake. The town is easily walkable, and you can spend hours wandering the cobbled streets, strolling by the shore, or dipping a toe in the lake. Taking a cooking class is always a great way to learn about the people and food of a particular place. That’s why it was one of our favorite things to do in Macedonia. At Risto’s Guest House in Ohrid (part of which doubles as the family home), we made pastries, traditional savory pies, and sweets treats. 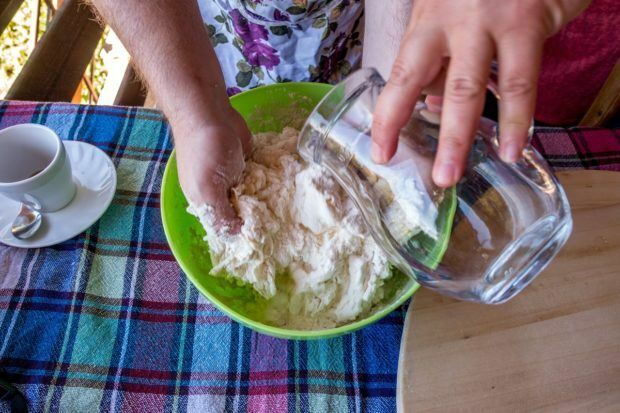 Under the direction of owner Anita, we learned the perfect way to roll Macedonian pastries and ate amazing dishes we made ourselves while learning about her and her family. 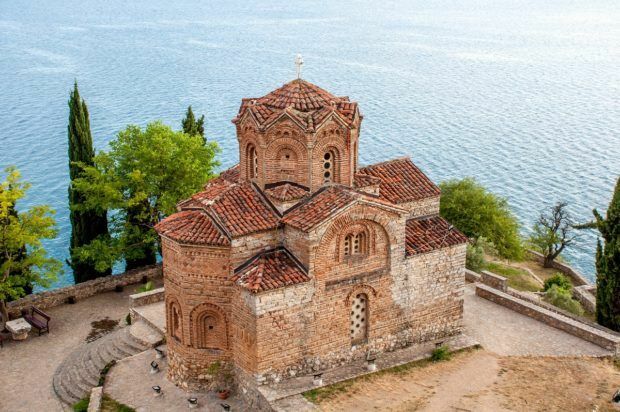 One of the most famous—and certainly the most picturesque—monastery is St. John of Kaneo overlooking Lake Ohrid. The 13th century monastery contains wonderful medieval frescoes and is accessible by walking from Ohrid or by boat. Less than 20 miles from Ohrid (also on the lake) stands the Monastery of St. Naum and the Springs. 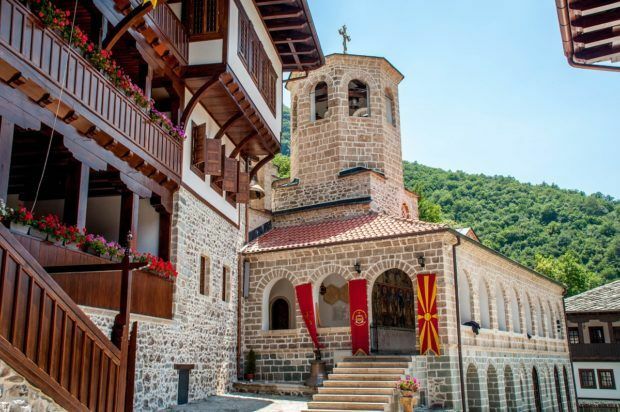 One of the most visited pilgrimage sites in Macedonia, the complex dates as far back as the 10th century, and the beautiful artwork inside is over 500 years old. Macedonians believe you can still hear the saint’s heartbeat by pressing an ear to his tomb. Another impressive monastery, the Monastery of St. John Bigorski is a little over an hour away in Mavrovo National Park. Known for its carvings and artwork, the monastery supposedly contains the forearm relic of St. John the Baptist. Rebuilt several times of the centuries, St. John Bigorski is not as old as some of the other monasteries, but is impressive in its own way. And the brothers there will even stop to chat with visitors. We visited Macedonia as guests of JayWay Travel, specialists in custom tour packages across destinations in Central and Eastern Europe. All opinions of the natural and historic are our own. What do you think about 11 Ways to Discover the Best of Macedonia?